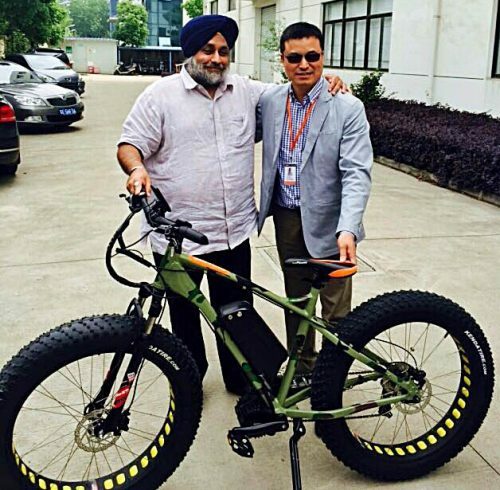 Suzhou (Shanghai) May 10 – Punjab is set to launch an electric- cycle revolution with Deputy chief minister Sukhbir Singh Badal giving the go ahead for laying the foundation stone of the proposed E-Cycle Valley in Ludhiana in August besides simultaneous allotment of land to five international companies to manufacture e-cycles for the domestic and international market. The Deputy chief minister took this decision after visiting the factory of leading e-cycle manufacturer Bafang at the Industrial Park here besides one to one meetings with leading manufacturers as well as component suppliers. “I have studied the entire eco-system necessary to come out with affordable electric cycles and am confident this can be implemented at the – Cycle Valley in Ludhiana. The Punjab government will fast track permissions as well as allot land to all the five promoters who have decided to set up manufacturing facilities including four Chinese and one Taiwanese company”, he added. Mr Sukhbir Badal during his meetings with investors including Mr Sunny He of Bafang company at Suzhou here besides representatives of Brian Tang of Sate Lite Kent Lee of Hangzhou Joy Kie Industry, Johnson Ju of Shenzhen New Canghai Machinary and Johny Lin of Promax Taiwan said e-cycles were non existent in India and that there was a huge scope for the same. “The time is ripe for e- cycles to make an entry into India and pioneering companies will benefit the most”, he added. The Deputy CM said as far as the Punjab government was concerned, it would promote the E Cycle Valley as a world cycle hub spread over 300 acres. “Efforts are on to facilitate manufacture of 15 lakh cycles per year besides creating 1.5 lakh employment opportunities”, he told investors. Mr Badal also took a round of the Bafang company complex to understand different components needed for manufacture of e-cycles besides inspecting the final product. He urged Bafang to develop best e-cycle solutions for both the Indian and the European market. Hero Cycles Chairman Pankaj Munjal gave a brief about potential of the e-cycle industry in India. He said there was a huge gap between the cycle and motor cycle segment with consumers paying Rs 4,000 on an average for a cycle and Rs 50,000 for a motor cycle. He said there was a huge potential for competitively priced e-cycles costing Rs 10,000 and even premium ones costing up to Rs 25,000. Earlier the Deputy CM also visited the Suzhou Industrial Park spread over an area of 80 square kilometres. The Park, which is a joint Chinese- Singaporean enterprise, has two urban cores besides four urban districts including an international trade zone as well as educational and tourist areas. Mr Badal while appreciating the innovative space mix at the Park said the Punjab government would use the experience of Suzhou in the development of New Chandigarh. The high level delegation which visited Suzhou included chief parliamentary secretary N.K Sharma, Media Advisor to Deputy CM – Jangveer Singh, Additional Chief Secretary Karan Avtar Singh, Principal Secretary to Deputy CM – P S Aujla, Invest Punjab Additional Secretary D.K Tewari and Special Principal Secretary to Deputy CM Rahul Tewari. Mr S.C Ralhan of Sri Tools also formed part of the delegation.